The Tiler’s Room was designed as the main entrance of the Cathedral. It is a perfect cube of 33 feet, which is to remind us of the time Christ lived on earth and the highest degree of Freemasonry. 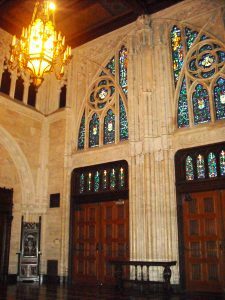 The windows above the entrance doors contain many emblems found in Masonry, from the 1st Degree of the Symbolic Blue Lodge to the 32nd of the Scottish Rite. 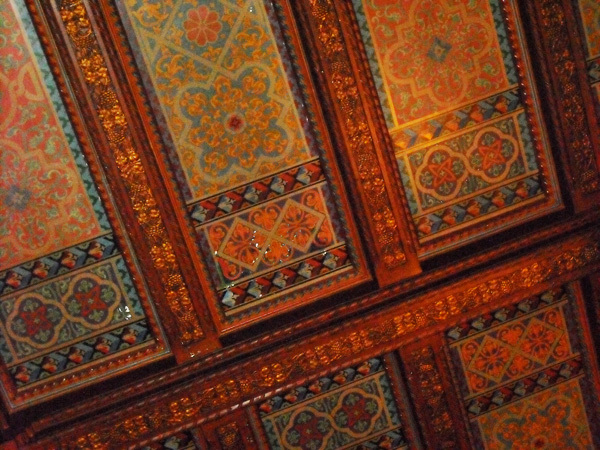 The ceiling is hand-painted plaster and the walls are Italian travertine marble. The marble and woodwork are hand carved. The floor is a reproduction of the floor in the Inner Chamber of King Solomon’s Temple. In the center is a polished brass medallion which contains the 12 signs of the Zodiac and the symbols of the four bodies of Scottish Rite Masonry: The Triangle for the Adoniram Lodge of Perfection; the Scale of Justice for the Saraiah Council, Princes of Jerusalem; the Cross for the Indianapolis Chapter of Rose Croix, and the Double Headed Eagle in the center for the Indiana Consistory. While the signs of the Zodiac have nothing to do with Freemasonry, on the medallion they symbolize its universality.